OPOL, Misamis Oriental – On February 10, 2011, security guards of A. Brown Company, Inc. pointed their guns at Gilbert Paborada, a leader of the local indigenous peoples group Pangalasag. One of the guards threatened Paborada that he would be shot if he and his fellow tribesmen do not leave the land. Paborada told this to the members of an international fact-finding mission led by Pesticide Action Network (PAN) Asia and the Pacific, Asian Peasant Coalition (APC), Peasant Movement of the Philippines (KMP), and Kalumbay Regional Lumad Organization. The mission was held May 6 to 8 to look further into the impact of the palm oil plantation into the lives of Higaonon tribe, where Paborada belongs. Pangalasag has been vocal in its opposition to the entry of the American company’s palm oil plantation in Opol. Through the facilitation of the Department of Environment and Natural Resources (DENR) and with the support of the local government, A. Brown started its operations in the area in 2010. The entry and expansion of A. Brown’s plantation is accompanied by gross human rights violations, including strafing, illegal arrest, and other forms of harassment. On March 10, 2011, at around 11 a.m., Pangalasag members Edwin Baranggot, Jemar Armilla, Fausto Magpulong, Raul Magpulong, Jose Paborada, Dante Paborada and Ruel Tagupa headed out to gather ‘bagacay,’ a kind of bamboo. However, they could not proceed to their intended destination since they were barred by guards of A. Brown Company. The farmers proceeded to their temporary shelter at sitio Limbasan in Tingalan village to rest. After almost an hour later, a dump truck, two pick-up vehicles and a jeep arrived. One of the men, armed with a shotgun, got off from one of the vehicles and ordered the farmers to stay put. The command was followed by a series of gun fire aimed at the farmers. Four were able to flee but two of them Baranggot and Armilla were arrested. “I was forced to the ground. They stepped on my nape and tied me. Someone kicked my back. Then they asked me to stand up and I was again kicked on the stomach. One of the men grabbed my neck and brought me back to the hut. A man told me: ‘Why are you planting in this area? Why don’t you just give it to A. Brown?’ Then he slapped my face,” Baranggot told members of the fact-finding mission in the local dialect. The men, numbering more than 20, showed neither identification cards nor a warrant of arrest. Baranggot and Armilla were brought to the Opol municipal hall. Shortly after that, they were brought to the office of the National Bureau of Investigation (NBI) at the capitol where they were detained for one day and one night. The next day, they were charged with direct assault and were imprisoned for two weeks at the Misamis Oriental Provincial Jail. They were released after posting bail. On the day of the arrest, Pangalasag’s Paborada went to the NBI to check on his colleagues. Nolan Gadia, chief investigator of the NBI, said the farmers could be arrested because they were harassing the security guards in the area. Gadia also told Paborada that A. Brown reported to the NBI that there were armed groups in the area. One was injured during the shooting. 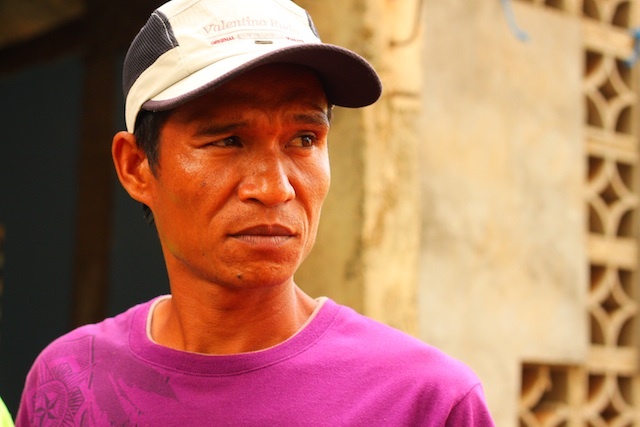 Jose Paborada, 40, told members of the fact-finding mission: “It’s the first time that I heard gunshots so I started rolling until I reached the cliff. He just rolled down because I was afraid of being shot. I hid in the canal then crawled for about an hour until I reached the river. There I noticed that my left foot was numb. Only then did I realize that I was shot,” he said, pointing at his left lower limb, just below his knee. Meanwhile, Roel Magpulong showed signs of trauma after the incident. Magpulong was able to go home 12 hours after the shooting. He hid behind the tall grass. His wife, Grace, said her husband was in a state of shock when he finally came home. Since the shooting, none of them was able to return to their farm. A. Brown immediately planted palm oil on their land. Sometime in November 2011, the house of Victoria Tabubo, 64, who was among those who were forced to leave after the shooting incident earlier, was burned down by A. Brown security guards. They took her coconuts and planted palm oil on the land. Likewise, the cassava planted by Catalina Atayde, were uprooted by company personnel who planted palm oil trees on her land instead. Sometime in September/October 2011, armed security guards accompanied by a local barangay official working for the palm oil plantation went to the farm of Amadeo Payla, 66, and uprooted and destroyed his crops with chemicals. Payla was held at gunpoint. Another farmer, Leoncito Mabao, 34, was held at gunpoint as 20 armed security guards uprooted and destroyed his crops using chemicals. Other leaders and members of Pangalasag have been put under surveillance and have been receiving threatening text messages. Members of the fact-finding mission experienced harassment. Company guards prevented the participants from visiting the house of a Higaonon located inside the plantation, claiming that it was “private property”. A. Brown personnel also reportedly threatened to abduct villagers who would join the focused group discussion. 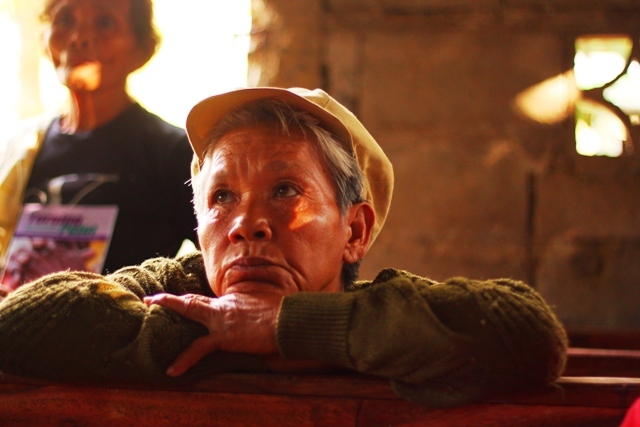 A village official in Bagocboc also branded members of the fact-finding mission as New People’s Army (NPA) rebels. In your other article, I asked whether or not you’ve tried to get the side of A Brown.